The United States Fencing Association provides the following information about fencing. The sport of fencing is fast and athletic, a far cry from the choreographed bouts you see on film or on the stage. Instead of swinging from a chandelier or leaping from balconies, you will see two fencers performing an intense dance on a six-feet-by-forty-feet strip. The movement is so fast the touches are scored electrically—more like Star Wars than Errol Flynn. Foil, épée, and saber are the three weapons used in the sport of fencing. 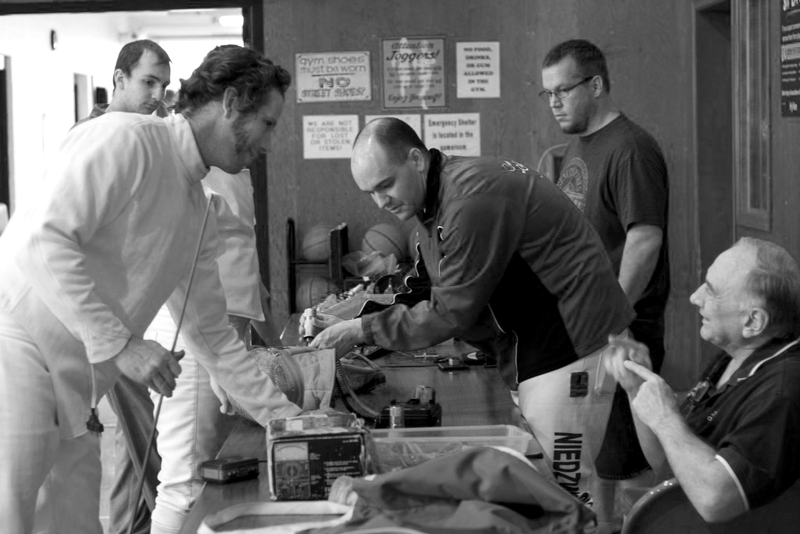 While it is not unusual for fencers to compete in all three events, they generally choose to develop their skills in one weapon. 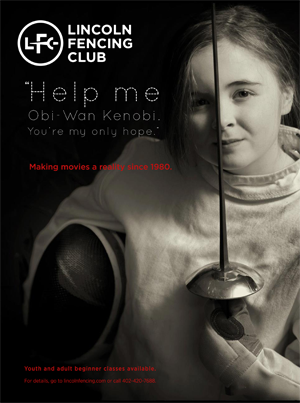 Until recently, women were permitted to compete only in foil, but now the United States Fencing Association and the Fédération Internationale d’Escrime (FIE) offer national competitions for women in épée and saber. Women’s épée was added to the World Championships in 1989 and was held for the first time at the Olympic Games in 1996. Foil and épée are point-thrusting weapons. Saber is a point-thrusting as well as a cutting weapon. The target areas differ for the three weapons, though all three are scored electrically. Coach Joshua Bush has his fencing equipment checked by the armory. The main object of a fencing bout (what an individual game is called) is to score fifteen points (in direct elimination play) or five points (in preliminary pool play) on your opponent before he scores that number on you. Each time a fencer scores a touch, she receives a point. Direct elimination matches consist of three three-minute periods. The foil has a flexible, rectangular blade approximately thirty-five inches in length and weighs less than one pound. Points are scored with the tip of the blade. The valid target area in foil is the torso, from the shoulders to the groin, front and back. It does not include the arms, neck, head, or legs. The foil fencer’s uniform includes a metallic vest (called a lamé) that covers the valid target area so that a valid touch will register on the scoring machine. A small, spring-loaded tip is attached to the point of the foil and is connected to a wire inside the blade. The fencer wears a body cord inside his uniform that connects the foil to a reel wire, which connects to the scoring machine. There are two scoring lights on the machine. One shows a green light when a fencer is hit, and one shows a red light when her opponent is hit. A touch landing outside the valid target area (that which is not covered by the lamé) is indicated by a white light. These off-target hits do not count in the scoring, but they do stop the fencing action temporarily. The épée (pronounced “EPP-pay”), the descendant of the dueling sword, is similar in length to the foil but is heavier, weighing approximately twenty-seven ounces, with a larger guard (to protect the hand from a valid hit) and a much stiffer blade. Touches are scored only with the point of the blade. The entire body is the valid target area. The saber is the modern version of the slashing cavalry sword and is similar in length and weight to the foil. The major difference is that the sabre is a thrusting weapon as well as a cutting weapon; fencers may score a valid touch with the edge of the blade. The target area is from the bend of the hips (both front and back) to the top of the head, simulating the cavalry rider on a horse. The saber fencer’s uniform includes a metallic jacket (lamé) that covers the target area to register a valid touch on the scoring machine. The mask is different from foil and épée, with a metallic covering, since the head is valid target area. In essence, right-of-way is the differentiation of offense and defense made by the referee. The difference is important only when both fencers’ lights go on at the same time in foil and saber. When this happens, the winner of the point is the one who the referee determined was on offense at the time the lights went on. Épée does not use the right-of-way in keeping with its dueling origin—he who first gains the touch earns the point. Or, if both fencers hit within one-twenty-fifth of a second of each other, both earn a point. However, it is equally important to have a sound defense for épée, since the entire body must be protected from a touch. For those new to fencing, it is difficult to follow the lightning speed of the fencers’ actions. To become more comfortable in watching a fencing bout, focus on one fencer. The fencer being attacked defends herself by use of a parry, a motion used to deflect the opponent’s blade, after which the defender can make a riposte, an answering attack. Thus, the two adversaries keep changing between offense and defense. Whenever a hit is made, the referee will stop the bout, describe the actions, and decide whether or not to award a touch. Fencers seek to maintain a safe distance from each other—that is, out of range of each other’s attack. Then, one will try to break this distance to gain the advantage for an attack. At times, a fencer will make a false attack to gauge the opponent’s reactions. As you become accustomed to the speed of the game, the tactics and strategies will become more apparent, and you will gain a better understanding for the finesse and fascination of fencing!